Getting your nic fix used to mean lighting up a Marlboro, but with the rise of electronic cigarettes, the market's been flooded with countless pen vaporizers that get the job done without being gigantic. So which one should you, the neophyte vaper, choose? The V2 Pro Series 3 is one great choice. 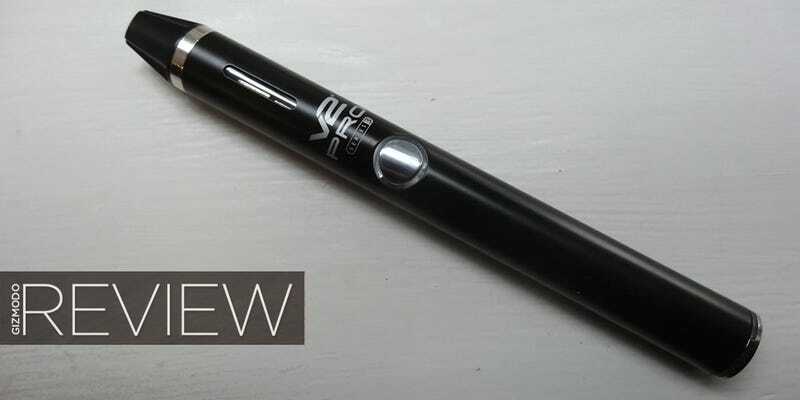 The current generation of portable vaporizers fall into one of two broad categories: well-built but expensive, like the Firefly or inexpensive yet flimsy, like the Sutra from GotVape (review incoming). The V2 Pro aims for the best of both worlds: a high-quality, versatile, portable vape that won't cost you an arm or a leg (or a lung). The mouthpiece and material tank pull out of the body as a unit and are held in place by a small magnet, as is the USB charging cable. There is nothing to screw into or out of, thereby virtually eliminating the dangers of cross threading or having hash oil seep into the seams and jam up the unit. It's a small detail, but it makes all the difference in the world. Loading the unit is easy, simply give the mouthpiece a slight tug to disengage the magento-lock, then unscrew it from the 1.6 ml tank (rated to 800 puffs per fill), inject your favorite e-liquid into the canister, and reassemble. Power from the 650mAh battery pack is controlled by the unit's single face button. Press it three times in under two seconds to lock or unlock the V2, then press and hold it to activate the 338-degree F (170 degree C) heating unit. You can't choose a specific temperature setting with the V2, though the preset level is pretty much ideal. Less than a second, your mouth fills with thick piles of vapor—it's crazy, you don't even need to inhale. The thing produces so much vapor. Charging is equally easy, simply plug the included USB charger into a port and set the other end against the base of the pen to engage the magneto-lock. A ring LED at the base will glow red while charging then turn green when it's ready for use. You can also use the pen while it's charging, a super handy feature not often found in sub-$100 vapes. The build quality and performance of the V2 Pro Series 3, especially at a $60 price point, is unmatched. From the billowing banks of vapor it produces to the seemingly inexhaustible battery (I averaged over a full day of toking and more than a canister of liquid per charge) that replenishes itself in under an hour. For $60, that's practically stealing! What's more, the V2 Pro is only going to get better as it's currently only operating at a third capacity with VMR scheduled to release a loose-leaf canister later this summer and a wax unit come Fall. No telling how great those units will be, or what they'll cost, but if the current product is any indication things are looking good. There's no easy way to get the V2 Pro to stand up when you're not holding it, which is a pain. It's not like the canister leaks or anything, more that the unit has a tendency to roll off tables and shelves at every turn, like a suicidal lemming. Like right now? Yeah, if you are already in the market for an e-cig. Since the wax canister later this fall and a loose leaf unit aren't out yet though, you're in for a little bit of a wait for full functionality. If you're looking for a multi-medium vape for right this second, your best bet might be the Zeus Thunder (review incoming). However, come fall and the release of the other two canisters, the V2 Pro Series 3 is shaping up to be a fantastic vaporizing system, and it's already great at what it does right now. You can buy the Series 3 here.